Now that summer is here, are you running around like crazy? I always think that summer will be easier after school is out but it seems almost as if it’s busier with driving The Kid around, vacations, and doing stuff in the evenings. One of the first things to go from the schedule is usually the workout. I can see you nodding in agreement. Until now, that is. I’m here to remove those excuses for you. 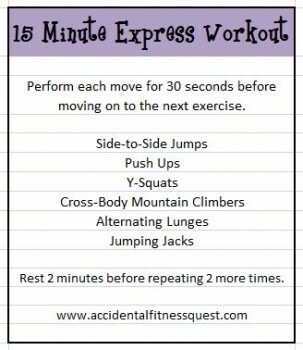 Here’s a 15 minute full body workout that takes nothing but you and a clock or stopwatch. You can watch TV while doing this. You can do it first thing in the morning before work and the kids get your attention. You can do it in a hotel room (while you’re saving money on food! ), park or backyard. Or get those kids up and moving with you! If you have a group of kids, try pairing them up with one timing and the other jumping and then switch. Challenge your kids to keep up with you or beat your number of reps. It’s more fun when you get everyone involved and make a game of it. In case you have questions on how to do any of the moves, I’ve included descriptions below. If you’re really short on time, you can do 2 rounds for just 10 minutes of effort. Have fun with it! From a standing position, jump 2 – 3 feet to the side. Keep your feet together during the jump and land with your feet together. Quickly jump back the other direction and land on both feet. Almost like jumping over an invisible log. Keep your abs braced and body in a straight line from knees to shoulders. Your hands should be slightly wider than shoulder width apart. Slowly lower yourself down until you are just above the ground. Push through your chest, shoulders and triceps to return to the start position. Keep your body in a straight line at all times. To make it easier, you can do push ups on your knees or with your hands elevated on a coffee table. Stand with your feet just greater than shoulder-width apart. Lift your arms up over your head and slightly angled to form a Y position. Keep your back and shoulder muscles contracted. Push your hips backward as if you were going to sit back into a chair. Squat as deep as possible, keeping your knees behind your toes. Push with your glutes, hamstrings, and quadriceps to return to the start position. Start in the top of the push-up position and brace your abs. Your shoulders should be above your wrists throughout the movement. Pick one foot up off the floor, and bring your knee up to your opposite shoulder. You will feel a twist in your abs, but don’t let your hips sag. Return your leg to the starting position and repeat with the other legs. Keep alternating legs. Step forward with the one foot, taking a slightly larger than normal step into a lunge position. Contract your glutes and bend your knee as you lower your body until your front thigh is parallel to the ground. Keep your upper body upright and your lower back flat. Push off with your front foot and return to standing position. Repeat on other leg. Stand on the balls of your feet with your feet shoulder width-apart and your arms at your sides. Jump your feet apart as you swing your arms overhead laterally. Jump your feet back together and return arms to the starting position.